Whether you are working on your laptop or tablet, reading a good book, watching television or eating dinner, this convenient over bed table is ergonomically designed to help you relax as you use it in bed. The laminate top, black powder coated steel frame is durable enough to hold your laptop, plates and other belongings. No matter how tall your bed is, you can easily adjust the height of this table to meet your personal needs. The table tilts at 3 different angles to give you added versatility and features a protective lip around the edge to prevent items from sliding off. Great for both home and hospital beds! Highly versatile overbed table is great for working on your laptop, eating breakfast, watching TV or enjoying a good book. Deluxe Heavy-Duty Over Bed Tilt-Top Table Whether you are working on your laptop or tablet, reading a good book, watching television or eating dinner, this convenient over bed table is ergonomically designed to help you relax as you use it in bed. 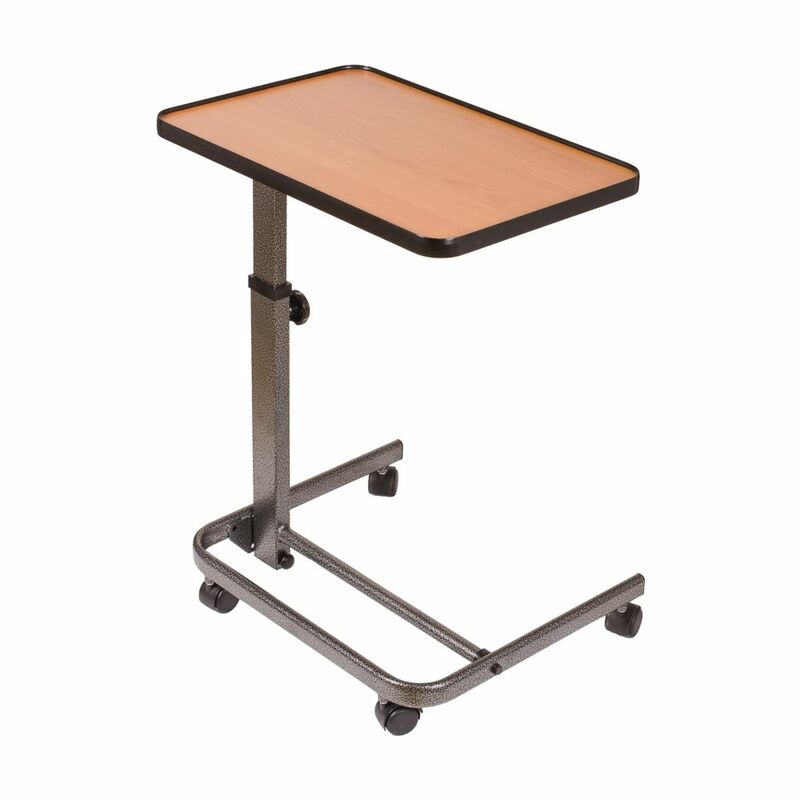 The laminate top, black powder coated steel frame is durable enough to hold your laptop, plates and other belongings. No matter how tall your bed is, you can easily adjust the height of this table to meet your personal needs. The table tilts at 3 different angles to give you added versatility and features a protective lip around the edge to prevent items from sliding off. Great for both home and hospital beds! Deluxe Heavy-Duty Over Bed Tilt-Top Table is rated 5.0 out of 5 by 1. Rated 5 out of 5 by Anonymous from I bought this for a disabled relative. Very sturdy... I bought this for a disabled relative. Very sturdy and was very easy to assemble. Spill proof.